In our previous post “What is Equine Chiropractic?” we have introduced the brief history of equine chiropractic, horse-specific adjustment requirements and application of VOM method to horses. In this publication, a list of equine chiropractors in each state will be presented. In addition to that a more in-depth analysis of the subject is presented. The listings are ordered alphabetically, from top to bottom by state and then by city. Why finding a VOM certified equine chiropractor is important? It is proven & widely accepted. International Association of Veterinary Chiropractitioners (IAVCP) certificates veterinarians on instrument-aided equine adjustment (better known as; Veterinary Orthopedic Manipulation – VOM). This organization has trained over 8300 graduate doctors in the United States alone. IAVCP is the largest animal adjusting group in the world. It is used more than all other horse adjusting methods combined. It is elemental in understanding the benefits of chiropractic care in the horse to realize that these conditions are the effects of the underlying condition that holds all of these problems in place. That underlying condition is the phenomenon that occurs at the spinal segment called vertebral subluxation complex. It is not a bone out of place. it is a neuronal interference which the body provides as a protective mechanism. Unfortunately, the body provides vertebral subluxation complex as a means to protect the animal. However, it doesn’t know necessarily when to release that protection and that interference can stay in place to the rest the animal’s life and if it is chronic it will eventually directs some sort of disease process such as the ones listed above. The nature chiropractic care is to restore normal neurological function at the spinal segments not necessarily joint motion. For instance, the horse with a swollen hock is commonly treated by injecting the hock with anti-inflammatories and mild anesthetics to try to reduce the inflammation and pain. This has been effective for the last 50 years however is fraught with a number of inopportune side effects. 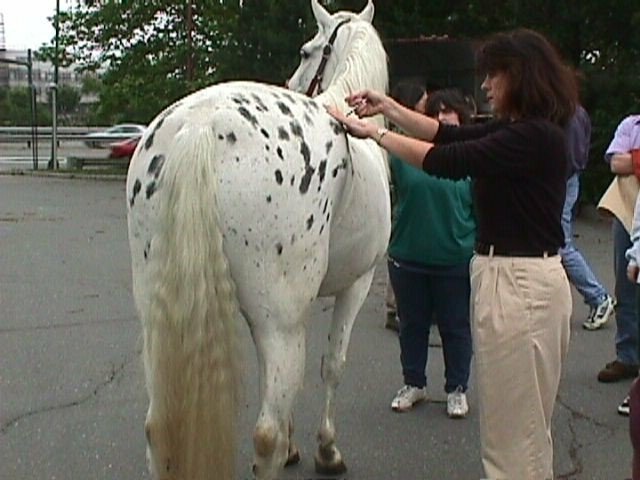 It is found in each and every one of those cases that there is a vertebral subluxation complex at the level of L3-4 in the lower lumbar’s of the horse and in less than area is rehabilitated the condition in the hock will either remain, go away and come back quickly and have to be treated again, or not be reduced whatsoever. Again, that which holds these conditions in place is a neuronal interference called vertebral subluxation complex that is not even recognized in the veterinary medical community and is the basis of every chiropractic adjustment done on humans. It is interesting to note there are as many practicing chiropractors in the United States as there are practicing veterinarians. A practitioner who can recognize this cause-and-effect relationship, and find the source of these neural interferences, and repair them, will be effectively able to completely treat conditions found in the horse and also be able to optimize the animals function and performance. (This optimization is a closely held secret by equine veterinarians on the racetracks and in equine competitions throughout the world). You may ask yourself at this point how could chiropractic adjustment possibly relieve colic, or laminitis, or navicular disease for that matter? The answer is that one of the major effects of the vertebral subluxation complex is vasoconstriction, or compromise blood supply to various tissues. If blood supply to the colon is compromised in the horse because of subluxation in the mid back, you’re going to get colic. If blood supply to the lamina of the hoof is compromised you’re going to get laminitis, which is painful, and the pain chemical (arachadonic acid) cascade produces more vasoconstriction, which then produces more laminitis, which produces more pain and vasoconstriction, a vicious circle. (This can be very acute or chronic in nature). It is important to note at this point that there are other methods for treating laminitis and other musculoskeletal and somato-visceral disease (autonomic nerve-directed disease) in the equine that we use in an adjunct to equine chiropractic. This is done as a means to optimize care and decrease the time it takes rest to bring about a resolution to the disease process. For instance, in laminitis will routinely adjust this animal on schedule which may take five or six adjustments over a 2 1/2 month period of time, and also apply the frequency specific low level laser therapy (FSLLLT). This combination of therapies quadruples the success rate that we have with chronic laminitis and navicular disease cases. The linking page has basic information on animal adjusting, equine chiropractic, in the incredible spectrum of disease conditions that we can treat using a low power highly selective laser that is frequency specific. 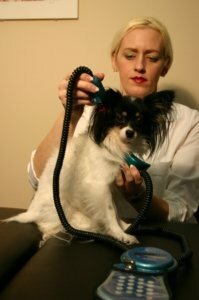 The applications and benefits of frequency specific low level laser therapy (FSLLLT) are so extensive as to incur a paradigm shift in the way that veterinarians approach veterinary disease particularly in large animals who cannot be easily operated on and whose mass makes medical therapy impractical or too expensive. Pretty much, “you name it and we can treat it with a frequency specific low level laser”. In gaiting problems for instance like a horse that will not change leads or is reluctant to change leads in training. We find that this animal has vertebral subluxation complexes in their lower cervical area that compromises their range of motion. So for them to change their lead they have to overextend the other leg within their stride and they can’t completely do that or it’s going to hurt so they reluctantly will not change leads. The subluxation complex exists so deep in the neck that manual adjusting at that level is impossible for most every horse much less it’s ability to be diagnosed. We can easily diagnose it with a spinal accelerometer and treated with that same accelerometer as it has the ability to deliver 95 times more force per unit time in the human body can deliver. That sounds like it might injure the horse but that’s absolutely not true because the force is delivered over a tiny amount of motion incredibly fast (Newton‘s second law of motion: force equals mass times acceleration), and the neuronal interference is removed in less than a millisecond. It is interesting to note that the horse and essentially all mammals have the resistance to motion that is 20 milliseconds. A human being can deliver a manual force with their hands and arms as fast as 80 milliseconds which is four times too slow if the animal does not want to cooperate. The spinal accelerometer delivers a force of 1 millisecond which is 20 times faster than the body’s ability to resist, so whether they like it or not they’re going to get adjusted. Patient cooperation is not needed. The horse does not even have to stand straight or hold still. It is very fortunate that the equine very commonly will hold still and allow their joints to be manipulated by manual chiropractors, unless they won’t, at which time they cannot be adjusted. This is exactly what we do with the VOM technology. It would seem that a simple, safe, fast chiropractic application with an innocuous metal device on a huge animal like a horse could not be very effective. One would think that a practitioner would have to engage in “horse wrestling” to really get the joint rehabilitated. At some point the practitioner who thinks that the technology seems too good to be true finally realizes that it is in fact true in almost exclusively converts to instrument-aided diagnosis and therapy for their chiropractic adjustment in horses. In this author’s opinion however, an animal chiropractor that can use a combination of manual an instrument aided technique is going to be the best of both worlds. It is also important to note that the VOM technology is not just the use of a spinal accelerometer device to deliver chiropractic adjustment. With over 150,000 clinical cases under our belts, we instrument aided chiropractitioners have mapped out a technique that has a very high success rate (91 to 93%). The IAVCP trains practitioners such as veterinarians, chiropractors, and other health professionals along with other paraprofessionals in the equine field in the VOM technology both in online courses that are certified, and in live courses that end in certification (CVCP). For more information about the technology, its applications, chiropractic instrumentation, and certification training both professional and paraprofessional please see the responding pages.